Our focus at Lang’s Kitchen & Bath is always on enhancing the quality of our customers’ lives with professional design advice, exceptional design concepts, and high quality installation services utilizing the finest products and materials. Our number one goal is total customer satisfaction in an efficient, well-designed space. While achieving this goal typically finds our team in the showroom or on a job site, we also take time from our schedules for education and training to make sure we are on top of the latest trends and techniques and can provide the absolute best service to our customers. Color Trends: Neutral colors will always be a foundation of the color palette for home design, but if you want to make a statement in your design then look to the top color trends for 2014/2015. The Pantone color of the year for 2014 is orchid and it is easy to see why this rich, vibrant hue would make a beautiful accent color in your home. The hot color trend predicted for 2015 is dark indigo. This up and coming color has grown in popularity, but it is also a sophisticated color that is expected to be around for a long time, and therefore makes an excellent choice when investing in a kitchen renovation or bathroom remodeling project. Dark indigo works very well in contrast to the popular white and gray color schemes, and could be used for an accent wall, for island cabinetry to contrast with white kitchen cabinets, as a stunning backsplash color, and more. Dura Supreme cabinetry featured this color choice in a recent blog here. Product Trends: Product selection is an important piece of our multifaceted design process, and the SEN conference was a great opportunity to see the latest innovations and to make sure we provide our customers with the best product choices for kitchen and bath design. Among the many products we saw are new mats from Hafele, which are designed to line your under-sink cabinet shelves and prevent damage to kitchen cabinets by catching spills and drips. The specially designed dimpled material can collect up to 1 gallon of water per 6 square feet. Another innovative product was the new countertop material coming soon from Silestone, which is made from porcelain, is highly durable, and is approved for both internal and external use. 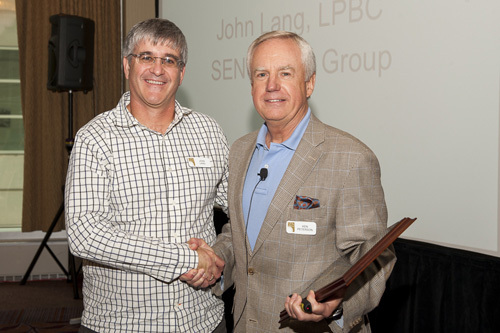 Setting Trends: John Lang was awarded the prestigious SEN Design Group Innovation Award at this year’s conference for his “relentless dedication to the development of the SEN Network Management Software”. John’s dedication over the last four years to this project, alongside his duties as owner and lead designer at Lang’s Kitchen & Bath, led to the release of the first ever dedicated management software program for the kitchen and bath industry. This program will revolutionize the ability of designers to manage their projects end-to-end and will significantly enhance the customer experience by aiding in producing a budget, selecting materials, and tracking and managing all aspects of a renovation project. We are very proud of John’s contribution and are excited to see the benefit of this software program for our own customers! For more design inspiration visit our kitchen design gallery or our bathroom design gallery. Contact us today for design advice so we can share our experience with you!